Posh centre back Ryan Tafazolli is about to be stretchered off in the game against Southend. Photo: Joe Dent/theposh.com. Peterborough United delivered a vibrant attacking performance as they reached the last 16 of the Checkatrade Trophy tonight (December 6). 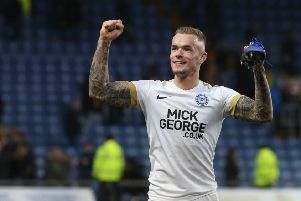 Posh beat Southend 2-0 at the ABAX Stadium with goals from Gwion Edwards and Marcus Maddison. They were both excellent as were Chris Forrester and Jack Marriott. Posh skipper Jack Baldwin plays the ball out of defence against Southend. Photo: Joe Dent/theposh.com. Gwion Edwards opens the scoring for Posh against Southend. Photo: Joe Dent/theposh.com. Ricky Miller: (for Marriott. 74 mins). Idris Kanu: (for Edwards, 74 mins). Danny Lloyd: (for Maddison, 77 mins).